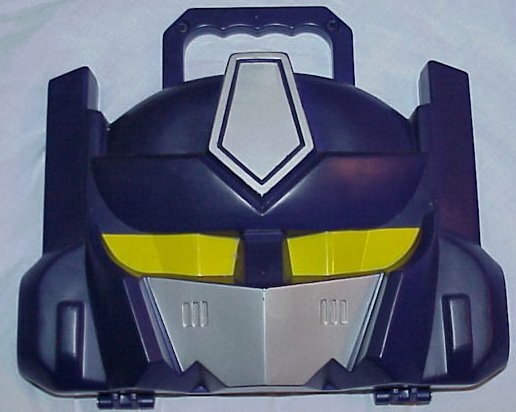 Back in the good old days of G1, HG Toys made all kinds of Transformers novelty items. 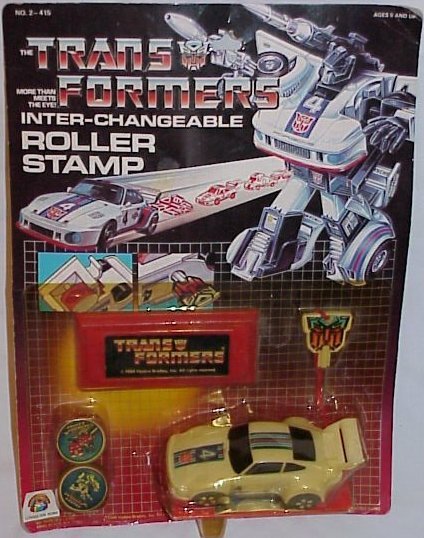 Stamp Bots were a fairly simple item, a small unarticulated transformers figure with a rubber stamp and self inking cap on the bottom. There were four characters, Optimus Prime, Jazz, Wheeljack, and Starscream. 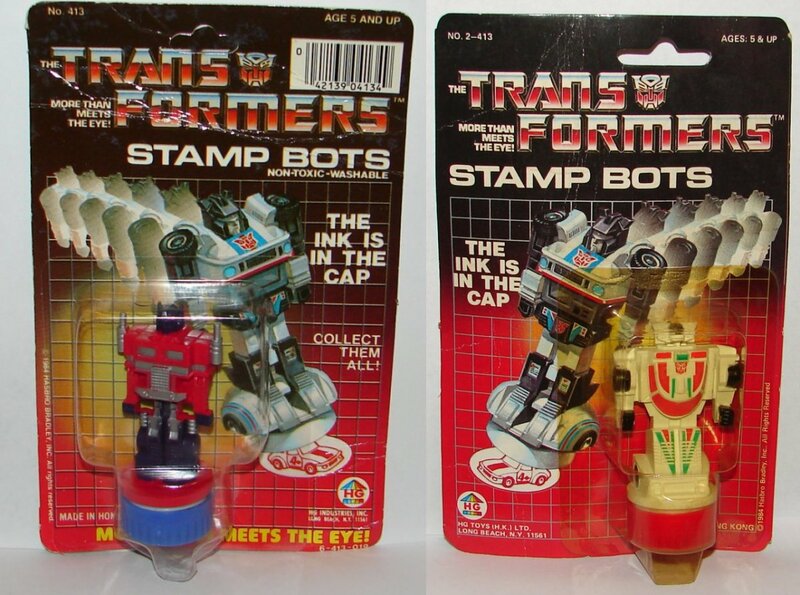 However, as I have recently discovered, Stamp Bots are anything buy simple when you start looking at the variations. 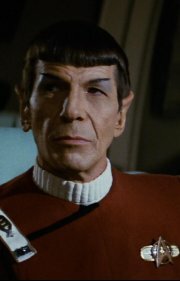 I am making a lot of assumptions in this blog, but they are all based on the available evidence. Stamp Bots seem to have been released in three waves. Wave one and two single packs and deluxe sets have the same packaging, but some paint and cap color changes. Wave three is completely different in packaging and paint. Let’s look at the single packaging first. 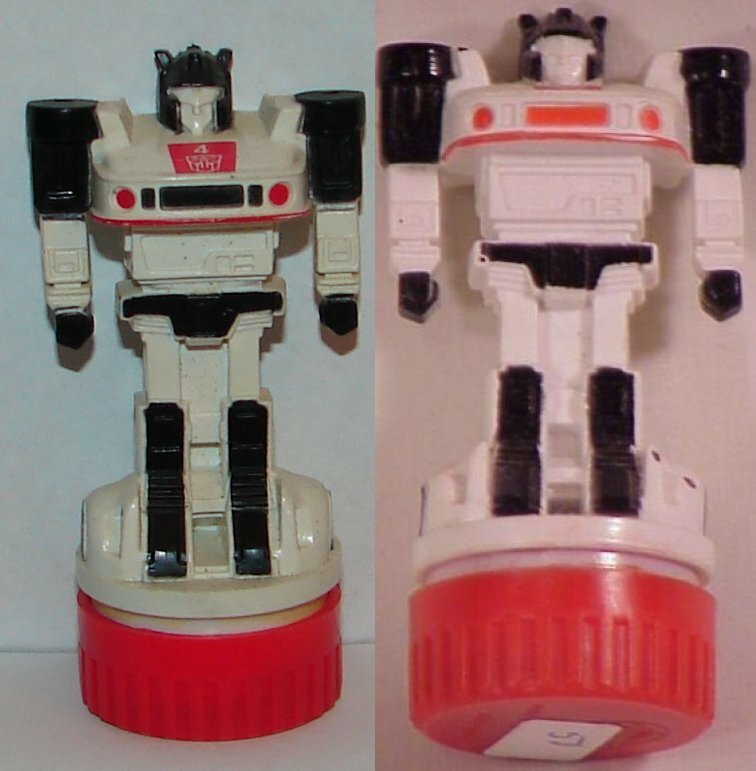 On the left is a wave one or two Stamp Bot, on the right is a wave three Stamp Bot. The obvious difference is that the bubble is packed on the opposite side of the card. Oddly my wave one and two Stamp Bots have clear bubbles, while my waves threes are all yellow. Clearly the newer plastic on wave three was a bad batch. The card art has been reversed. The yellow line of text at the bottom was removed from wave three, as was the “Collect Them All” and “Non-Toxic-Washable” lines. Both cards are dated 1984. Wave one and two had a barcode on the front and blank white card backs. Wave three has a gray card back that is printed with line art of all four stamps and the barcode. The only way to tell which came first, and why I’ve numbered the waves as I have, is the numbering in the upper left corner of he front of the car. 413 is on wave one and two cards, but wave three has 2-413. The barcode is also changed from wave one and two to wave three. Wave one and two barcodes are 4213904134, while wave 3 is 4256602413. I know nothing about how barcode numbers are assigned, but I am guessing the lower number came first. 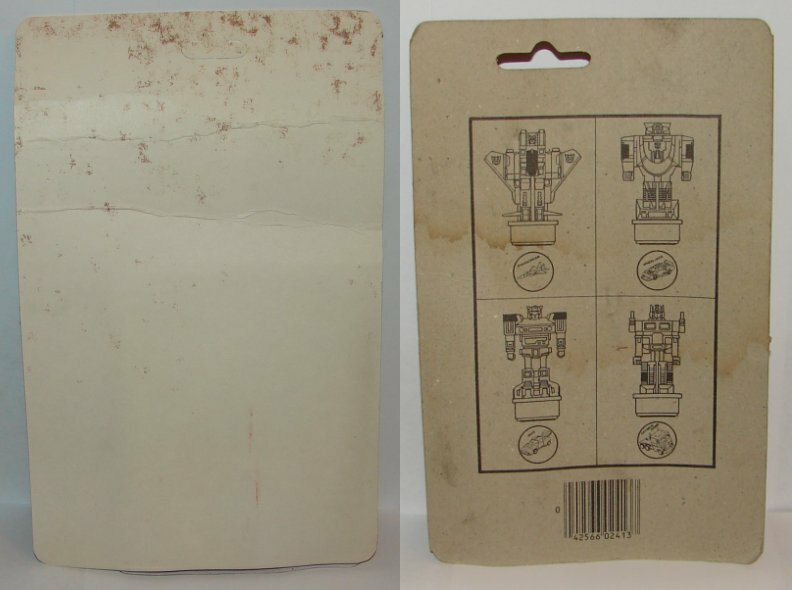 Now that we’ve established the packaging differences on the single carded Stamp Bots, let’s look at the stamps themselves. For some reason, there was a running change made to the stamps. Wave one has Wheeljack with a blue cap and Starscream with a red cap. Wave two has them switched, with Wheeljack having a red cap and Starscream a blue cap. At this time I do not have, nor have I seen visual evidence of a blue capped Starscream on a wave one/two card. Logically since I do have a red capped Wheeljack on a wave one/two card it should exist. There aren’t that many pictures of them online, but I am pretty confident I will find one eventually. If you have a blue capped Starscream on a wave one/two card, please send me a picture. Note the paint on Wheeljack’s chest. Wave one is off center and wave two is properly centered. I’m going to come back to this later, as it makes things very confusing. Now let’s look at the deluxe stamp sets. The deluxe sets follow a similar pattern as the singles. Wave one and two have the same color tray and same card back, but wave two has Wheeljack and Starscream’s cap switched just like the single carded figures. They have different color markers, but I have a feeling these were put in pretty randomly, so I wouldn’t necessarily consider that a variant (or there might be dozens of variants). 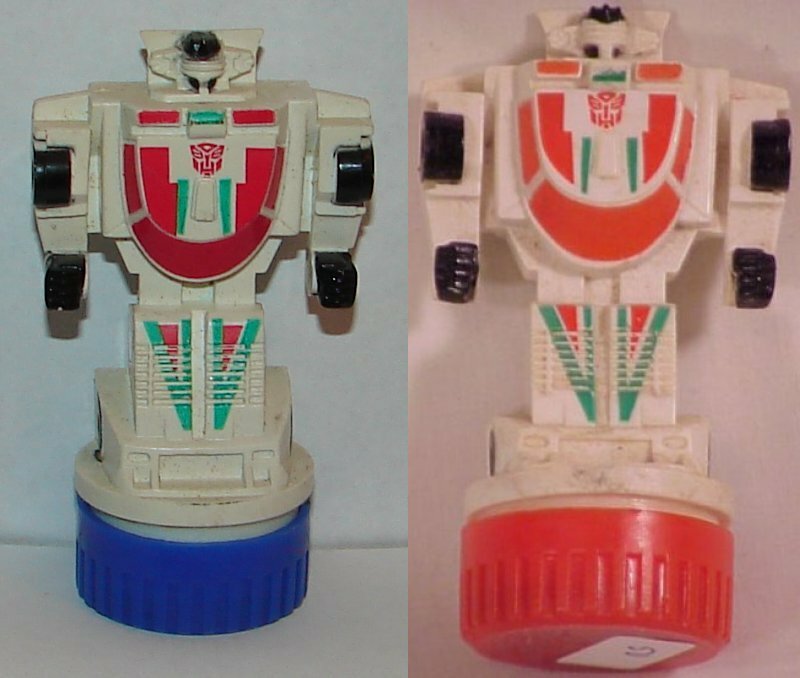 Note that both of these have off center paint on Wheeljack’s chest. More later on this. The deluxe stamp sets for wave three have a different card than wave one. The most obvious thing is the numbering in the upper left, 414 for the wave one/two and 2-414 for wave three. The wave three card is also thicker, more glossy, and does not have the odd half circle cut out in the back. The markers in wave three have a different shaped cap and smaller white end than wave one/two. They also have different barcodes with the wave three having the higher number. 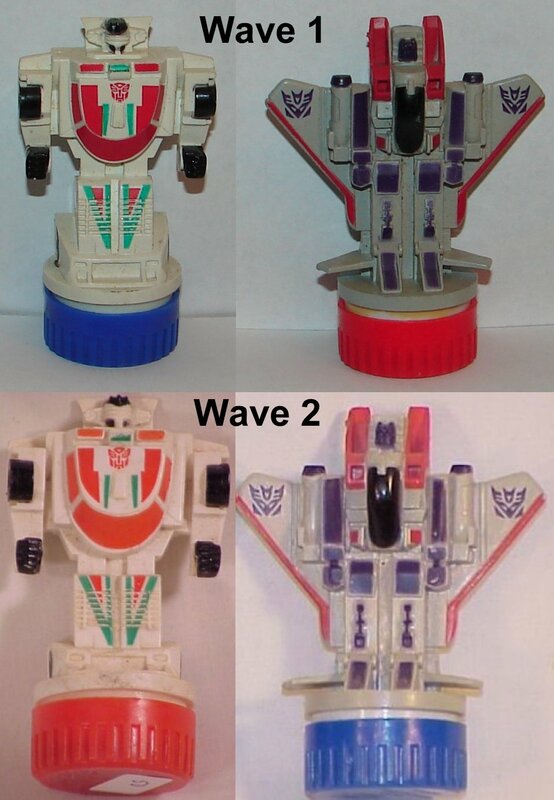 The other three stamps do not appear to have had any paint changes during the wave one and two run, but they all had paint changes in wave three. 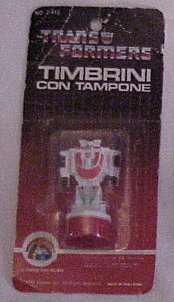 Oddly, Wheeljack is the only one who did not have any paint changes in wave three. 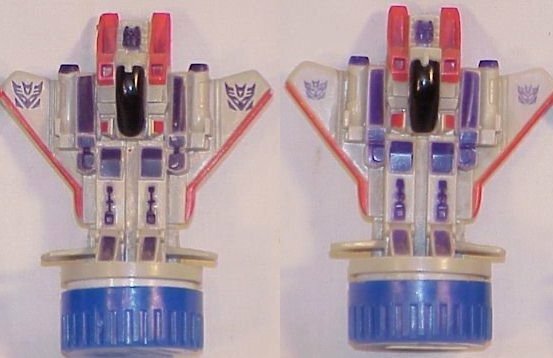 Wave one and two Optimus Prime had purple paint while wave three had blue. Wave one and two Jazz had a black grill that spanned from headlight to headlight. Wave thee only had the center area of his grill painted, and it was painted orange. 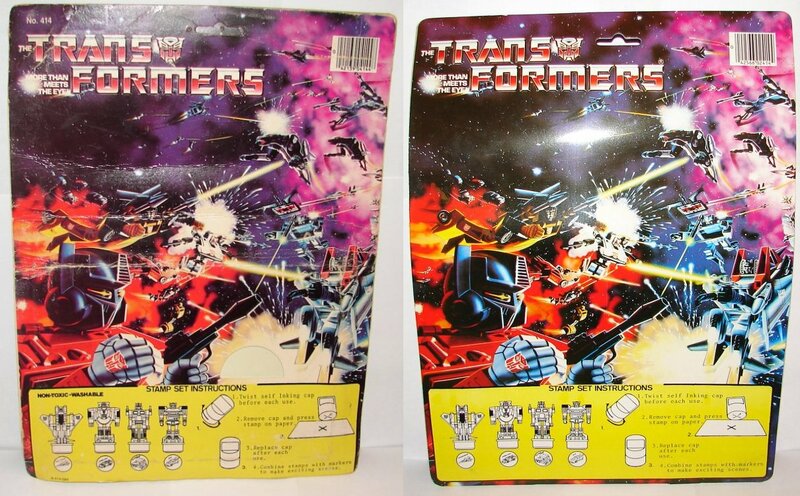 Starscream’s paint was dark purple for wave one and two and light purple for wave three. Also, he has smaller Decepticon symbols on his wings in wave three. I’m sure that this is a lot of information to digest, but if you’re actually still reading this blog, here is my Complete Visual Guide to HG Toys Transformers Stamp Bot Variations. 1. Red cap Wheeljack with off center paint, loose. 2. Blue cap Starscream on a card with the barcode on the front, MOC. 3. Deluxe Stamp Set with a blue tray, blue cap Starscream, and a red cap Wheeljack with centered paint on his chest, MOC. 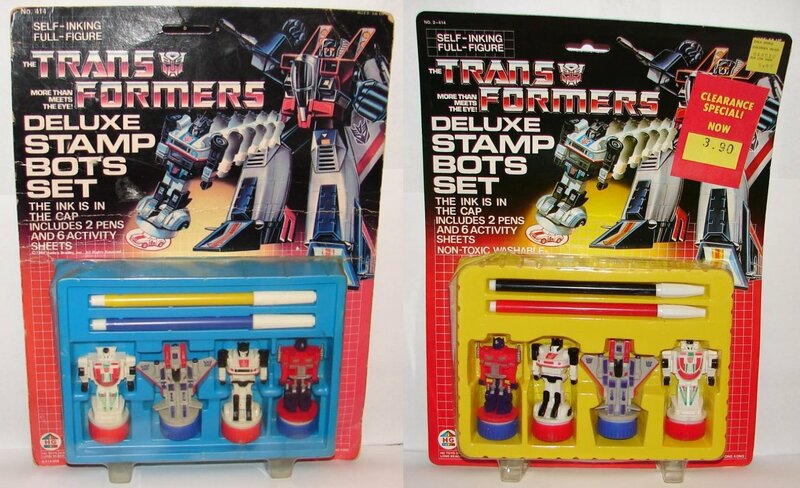 There are a few more Stamp Bot items I have. 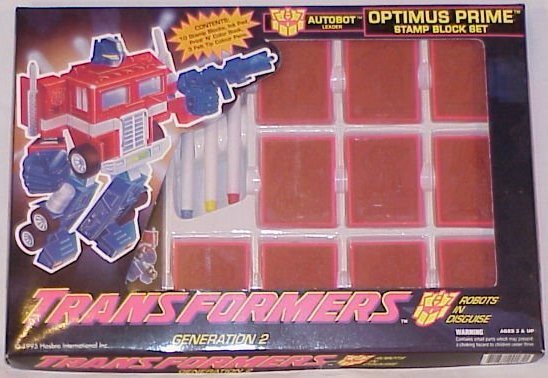 This Optimus Prime Case came with 2 of each Stamp Bot. Unfortunately, I can’t get to mine so I don’t have pictures of the inside. More importantly, I don’t have one in the box. Since the stamps are almost certainly not visible in a sealed box, there would be no way to know for which ones come with it, and in a loose set, the caps could have been switched. Unless I can find two boxed, I won’t be able to find anything more about this, and given it’s rarity, that’s not going to happen anyway. 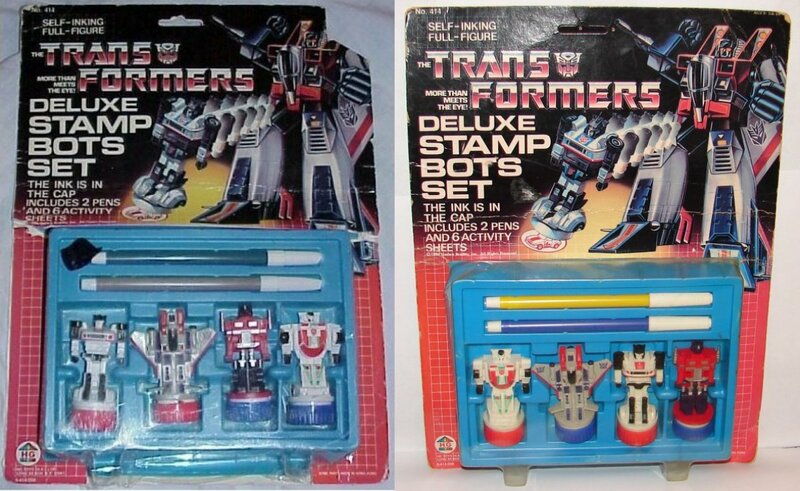 HG Toys made a few other stamp items that were not Stamp Bots. If there are any variants on these, I don’t know about them. The Jazz Interchangeable Roller Stamp is very cool. The stamp wheel shows each character in the process of transforming. There is also a Thrust Interchangeable Roller Stamp, but unfortunately, I don’t have one. I have seen a picture, which I thought I saved, but I can’t find it. I’ve had this one for a long time. I think I got it at Botcon 1996. 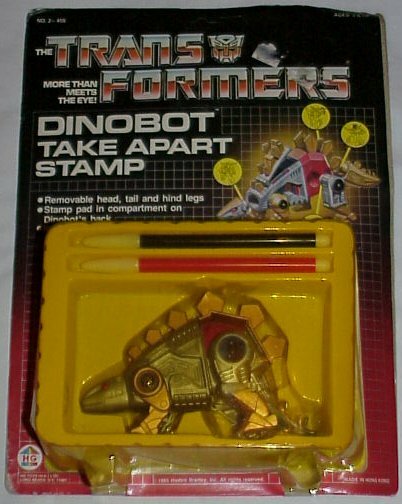 The Dinobot Take Apart Stamp is pretty cool looking and a very G1 accurate Snarl. You can take off his tail, head, and hind legs and use an inkpad stored in his back. This item is a favorite of mine. While not made by HG Toys, we got this stamp item in Generation 2. This Stamp Block set is a little less interesting than Stamp Bots, but it’s still pretty cool. Stamps were not limited to the USA. 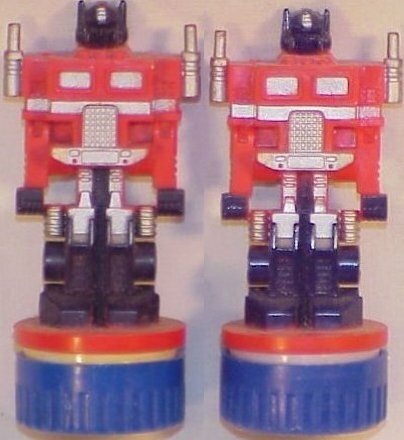 These are also called Stamp Bots (I am pretty sure), but are not made by HG Toys. 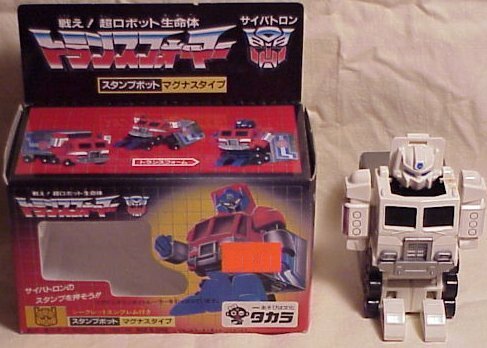 These are from Japan (obviously), Optimus Prime and the obligatory repaint into Ultra Magnus. I picked these up at Botcon 2004. They actually transform, but I don’t have pics of them in vehicle mode, and I can’t put my hands on them at the moment. Well, that’s it. I hope someone out there has use for all that Stamp Bot variation information. If not, well, at least it exists somewhere. As always, you can find over 11,500 Transformers merchandise items and collectibles at TFMuseum.com. I have just done a major update, including a new format for listings that will hopefully make it more readable. 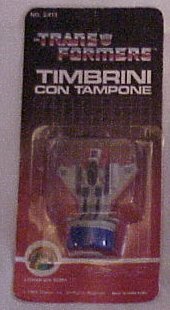 This entry was posted in Toys, Transformers, Transformers Artifact of the Week and tagged G1 Stamp Bots, Generation 1, Generation One, Jazz, Optimus Prime, Rubber Stamps, Snarl, Stamp Bot, Starscream, Thrust, Toys, Transformers, Ultra Magnus, Wheeljack. Bookmark the permalink. 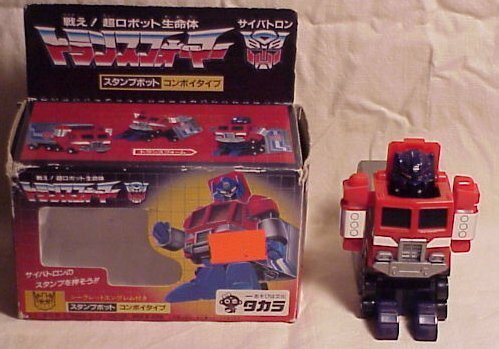 I didn’t see you mention it but I keep seeing Jazz with blue or red Autobot emblems on his chest. I’ve never seen that 3-Pack before. I’ll need to keep an eye out for one. Thanks.